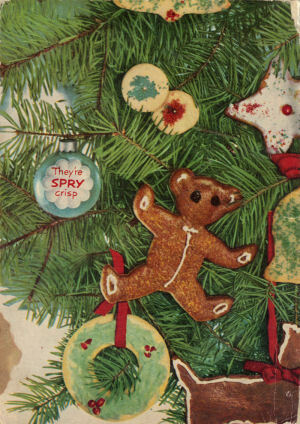 Here is the last page (21) of the vintage Spry cookbook “Aunt Jenny’s Old-Fashioned Christmas Cookies”. I’ve also included a scan of the back cover (at the bottom). This was published in 1952 and distributed by Lever Brothers Company (the maker of Spry shortening) and featured the company’s advertising character “Aunt Jenny”. You can view all the pages in this cookbook by visiting this category: Aunt Jenny’s Old-Fashioned Christmas Cookies, simply click a page title to view that section. There are scans of the pages included below that are clickable to view a larger size. Blend 2 tablespoons Homogenized Spry, 1 tablespoon butter or margarine, 1 teaspoon vanilla, and 1/4 teaspoon salt…Beat in 1/2 cup sifted confectioners’ sugar…Add 5 tablespoons scalded light cream, alternately with 2 1/2 cups sifted confectioners’ sugar, beating well after each addition…Add only enough cream to make a nice spreading consistency…Makes enough frosting for 2 to 3 dozen cookies. Melt together over hot water 2 tablespoons Homogenized Spry, 1 tablespoon butter or margarine, 3 oz. unsweetened chocolate. Pour 5 tablespoons scalded milk over 2 cups sifted confectioners’ sugar and 1/4 teaspoon salt. Stir until sugar is dissolved. Add 1/2 teaspoon vanilla. Add chocolate mixture and beat until thick enough to spread. Makes enough frosting for 3 dozen cookies. Mix 2 cups sifted confectioners’ sugar and 2 tablespoons hot water until smooth. Add a few drops vanilla and a few drops of food coloring to tint the desired color. Use in decorating Cookieland Cut-Outs, see page 2. Combine 1/2 lb. (1 cup) dried figs, ground, 6 tablespoons water, 6 tablespoons sugar, 1/8 teaspoon salt, and 1 tablespoon lemon juice. Cook over low heat until thick, stirring constantly (about 15 minuteS). Cool. Use as filling in making Fig Pincushions, page 17. Combine 2 cups dates, cut fine, with 1/2 cup sugar and 1/2 cup water. Cook over low heat until thick, stirring constantly (about 5 minutes). Add 1 cup nuts, chopped fine, and mix. Cool. 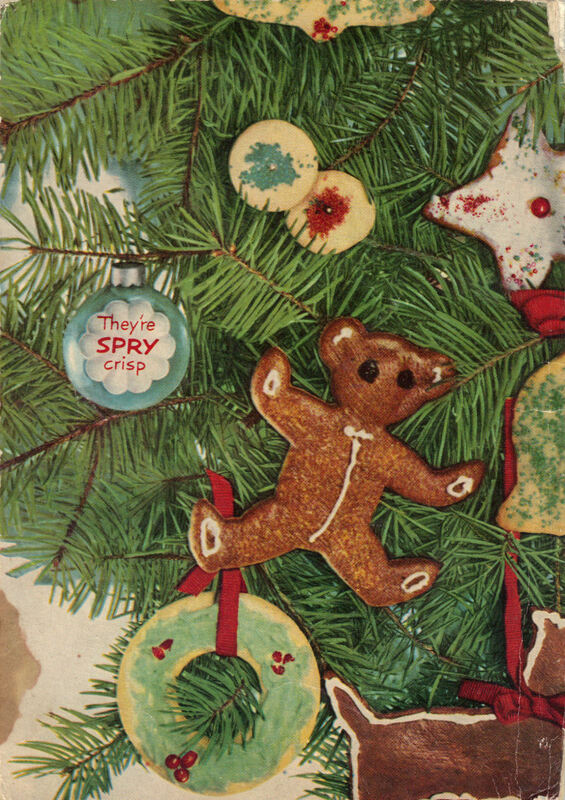 Use in making Date Whirligig Cookies, page 16. Dot filling on dough, then spread. 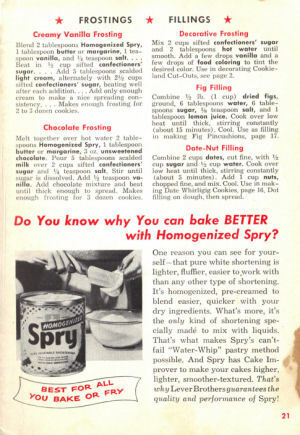 Do You know why You can bake BETTER with Homogenized Spry? One reason you can see for yourself–that pure white shortening is lighter, fluffier, easier to work with than any other type of shortening. It’s homogenized, pre-creamed to blend easier, quicker with your dry ingredients. What’s more, it’s the only kind of shortening specially made to mix with liquids. That’s what makes Spry’s can’t-fail “Water-Whip” pastry method possible. 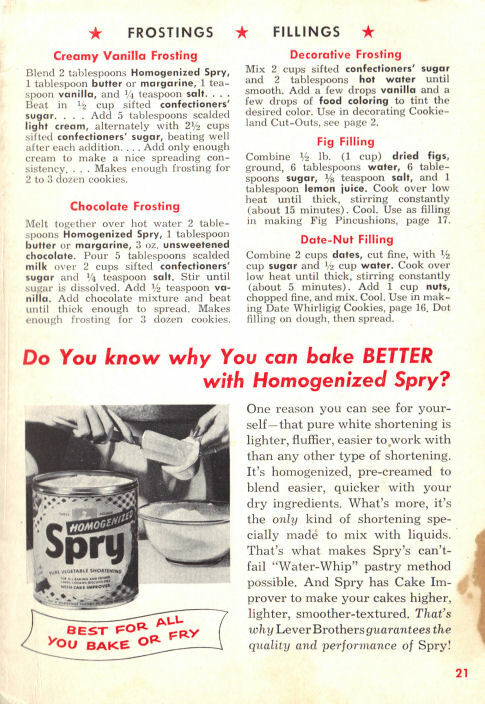 And Spry has Cake Improver to make your cakes higher, lighter, smoother-textured. That’s why Lever Brothers guarantees the quality and performance of Spry! Thank you so very much for publishing the “Aunt Jenny’s Old-Fashion Christmas Cookies!” Had been searching for years(5+) for a date and pecan rolled refrigerator cookie that my Grandmother use to make. Thank you again! NJMJr!